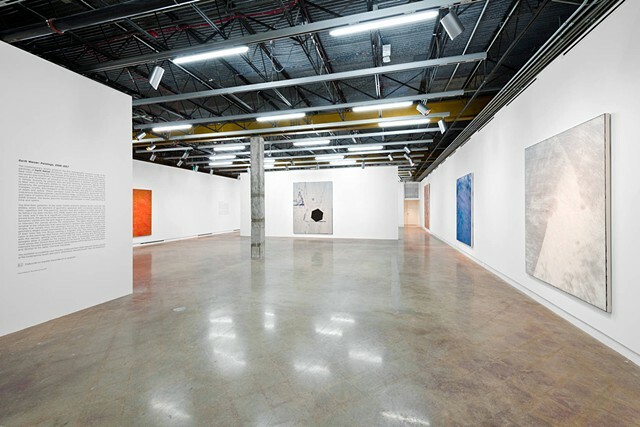 This exhibition is curated by Louis Grachos, Ernest and Sarah Butler Executive Director and CEO of The Contemporary Austin, with Julia V. Hendrickson, Assistant Curator. Text is by Hendrickson. Garth Weiser: Paintings, 2008–2017 is accompanied by a 128-page full-color, hardbound exhibition catalogue, published by The Contemporary Austin, April 2017. Raised in Tempe, Arizona, by parents who are both working ceramicists, in the early 2000s Weiser moved to New York to study art at Cooper Union (BFA 2003) and then Columbia University (MFA 2005). 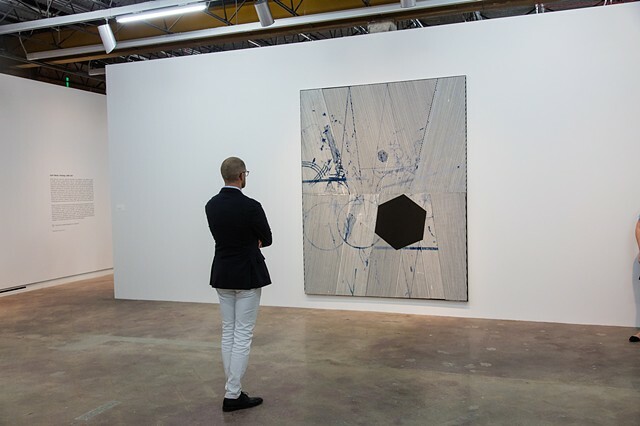 His early paintings are hard-edged and graphic—triangles, circles, and hexagons on flat picture planes hint at delineations of depth and space. These canvases recall the flat geometric abstraction of the midcentury Bauhaus artist László Moholy-Nagy, but with Weiser’s characteristically wry appropriation of the clunky visual culture and logos of twenty-first-century corporate capitalism. Later paintings become even more complex in their understanding of time and space. In the artist’s early period, the late 2000s, one element of geometry appeared with increasing regularity: the thin, repetitive line. The painting titled I wouldn’t have worn mascara if I knew I was going to be taking a trip down memory lane, 2008, from the collection of the Dallas Museum of Art, bookends The Contemporary Austin exhibition as the earliest work on view, and is the key to a significant transformation in the artist’s work. Here the steadfastly geometric presence of a dark hexagon is activated by the optical stutter of cerulean blue stripes radiating from the painting’s center in sharply delineated segments. Unexpectedly, up close the geometric edges are not crisp: furry tendrils of color sneak outside of their lines like iron filings seeking a magnetic pole. The paintings that follow chronologically explore the optical sensation of vibratory, close-knit patterns set against rich color contrasts between the treatments of fore- and background. 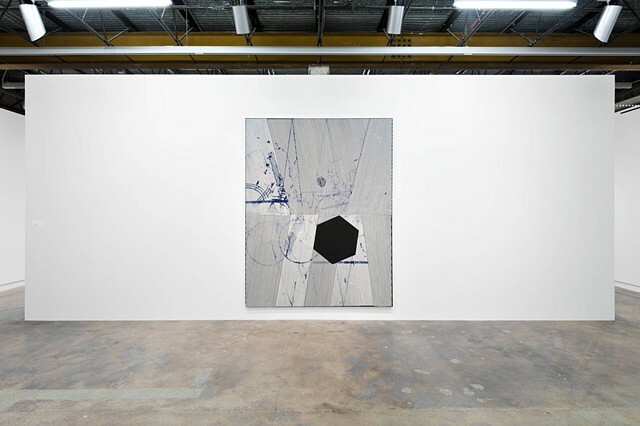 Vivid works like Tahitian Moon and Played at Low Volume, both 2011, chart Weiser’s intensely focused analysis of a visual space within painting that exists on two planes: one that resides closest to the painting’s support (the under-painting), and one that sits nearest to the viewer (the over-painting). The effects achieved are reminiscent of the works of a generation of Op artists who rose to prominence in the 1960s and 1970s, such as John Armleder, John McHale, Bridget Riley, Julian Stanczak, Victor Vasarely, and Jack Whitten. However, in Op Art it is the flatness of the tightly patterned surface that supplies the dizzying illusion, while for Weiser, the layered dimensionality of his surfaces results less in a direct optical illusion and more in a tension or vibration, with similarly arresting effect. This act of layering—quite physical in its presence—is produced by the artist’s application of slender intersecting lines of oil paint that form a scrim on the paintings’ surface. Oftentimes the under-painting is highlighted by the artist’s incisions into the over-painting, a surface removal process much like the technique of sgraffito in ceramics. 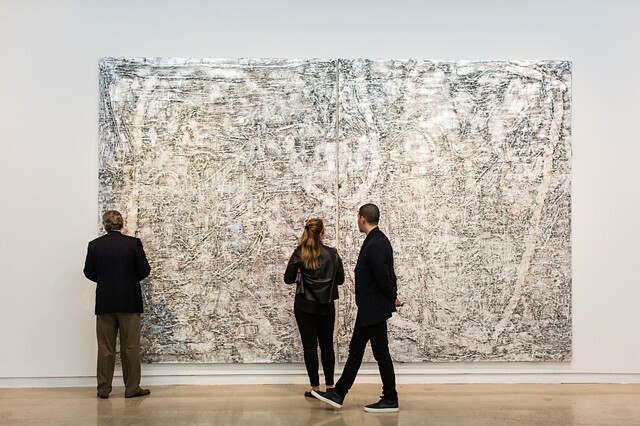 The multiplicitous nature of Weiser’s paintings is also present in his use of different kinds of paint: oil abuts enamel, on top of matte medium, three-dimensional fabric paint, acrylic, and tempera. The visual result is akin to the slick of oil on water or the wavering effects of a striped shirt viewed on a television screen—the overlaid patterns generating a disorienting moiré. 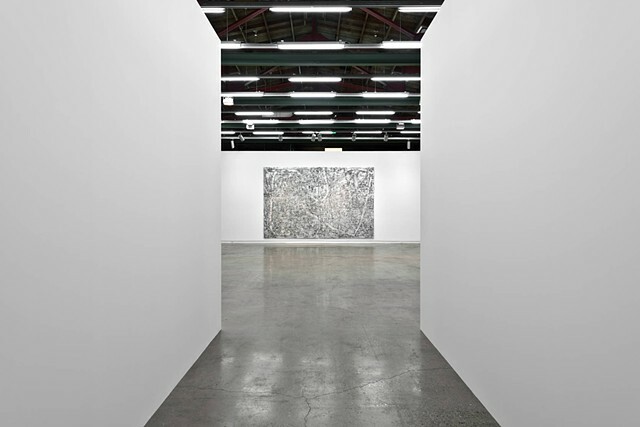 The artist’s most recent works reveal yet another chapter in Weiser’s aesthetic evolution, and a continuation of his unrelenting exploration of the medium of painting. A dramatic increase in scale has the effect, in person, of capturing the eye in a roiling sea of unrelenting, irregular pattern. Expanding upon Weiser’s earlier works, the gestural under-painting gains more prominence over the grid in paintings such as 8 and 17, both 2015. There are moments in these works that reveal the graphic influence of the artist’s interest in comics and the psychedelic culture of the 1970s rock scene. As asymmetrical clusters of expressive lines swing crisply into view, the shuddering interference pattern on the surface becomes aural in its presence, a twist on the anthropomorphic sound waves in Walt Disney’s animated Fantasia, 1940. 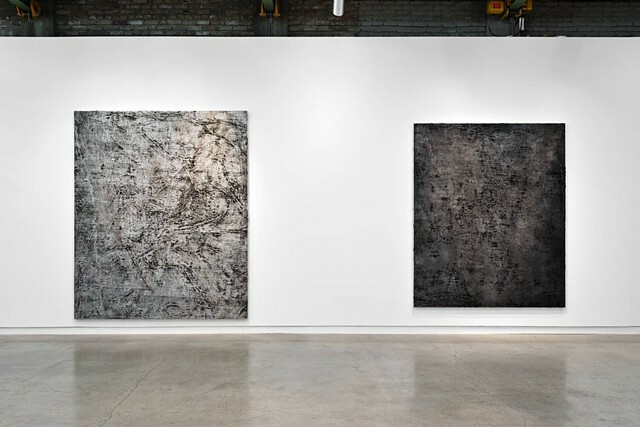 It seems almost possible to strum these paintings, in which a resonant sound could reverberate just below the surface—recalling the deep, dark volume beneath the strings of an acoustic guitar. In orchestral synchronicity, Weiser’s patterned stripes provide the bass line, a firm and structural rhythm in counterpoint to the leading melody of the fluid under-paintings. Anderson-Ramos, Sam. “Garth Weiser: Paintings, 2008–2017 at the Contemporary Austin.” Austin Chronicle. August 11, 2017. Zech, Brandon. 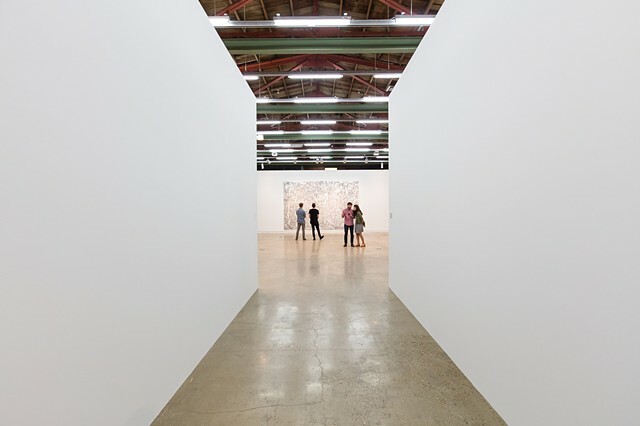 “Garth Weiser at The Contemporary Austin.” Glasstire. June 1, 2017. Meares, Joel. 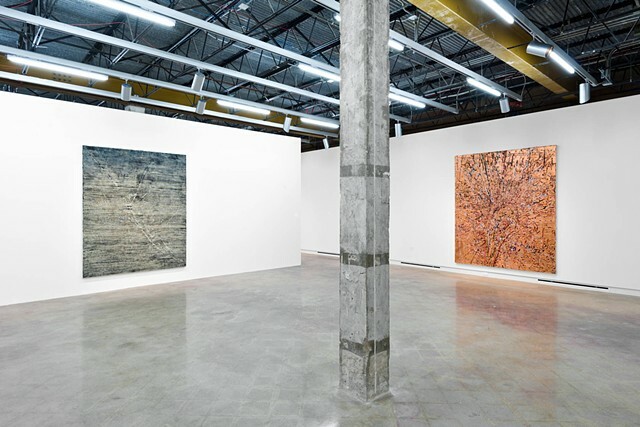 “Abstractionist Garth Weiser chats with Time Out about his latest exhibit at The Contemporary Austin.” TimeOut Austin. May 30, 2017.